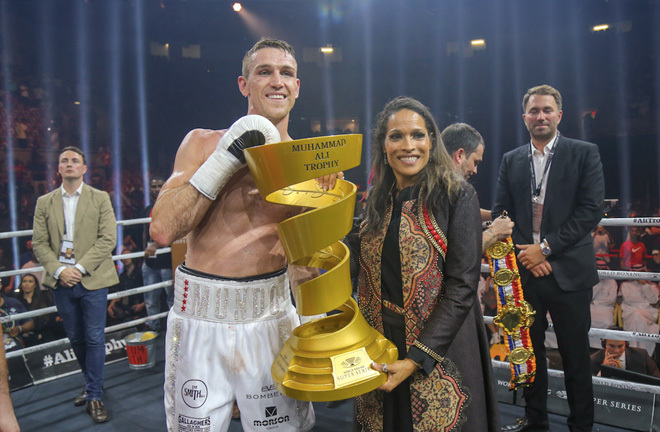 Callum Smith won the final of the Super Middleweight World Boxing Super Series last night, as well as a host of belts, by sensationally knocking out George Groves in the seventh round in Saudi Arabia. Most people’s opinions on the fight was that it would go the distance, and I myself thought that Smith may find the going tough having never fought at World Title level before. “Mundo” however defied that logic, and turned in a mature performance, under fire at times, to become World Champion, and receive the Muhammad Ali Trophy in front of 10,000 fans at the King Abdullah Sports Hall in Jeddah. There was good action throughout, and at times it became a fire-fight, with Groves seemingly buzzed in the third following an exchange, with a right hand landing for Smith that made Groves legs dip momentarily. Going into the seventh, the four judges were split, with two scoring in favour of Groves, one for Smith, and one level. Smith rendered all four judges redundant though, when he connected with a powerful left hook that signalled the beginning of the end for the Hammersmith man. Groves vs Smith – Ali Trophy. Photo Credit: World Boxing Super Series. 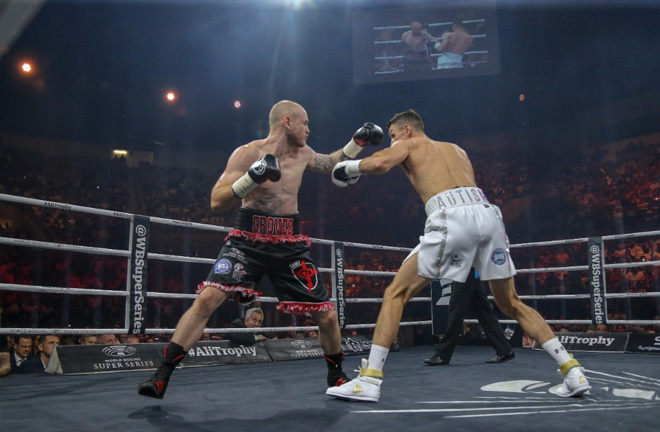 A follow up onslaught, with a right hand to the body, had Groves in big trouble, and he retreated towards the corner, before finally succumbing to the heavy fire by dropping to the canvas. Groves repeatedly shook his head throughout referee Luis Pabon’s count, and the full count was reached to hand “The Saint” his fourth career defeat. Smith becomes the new WBA (Super) and Ring Magazine Champion, as well as successfully defending his WBC Diamond Title, and instantly becomes a big player on the Super Middleweight scene. Smith told ITV Box Office post fight: “I know how good I am and knew I had the ability. I had a slow couple of years and people forgot about me. I think tonight I reminded people. “I felt I was ahead at the time of the stoppage. I feel like I was beating him at his own game, it was a boxing match at range. I got my big shots off first and he couldn’t take it. I’d like to think we are not finished but I’d love to defend my titles back in Liverpool, and give a great fighting city a great night of boxing”. Groves himself was classy in defeat: “It was not meant to be. Full credit to Callum. Boxed well, heavy-handed. He got me with a body shot at the end, which is embarrassing for me, because I’ve never been dropped with a body shot in my life, but he got the decisive shot in the end”. Groves will regroup, and I’m sure will be back, but is likely to have to come back the hard way at this stage of his career. Chris Eubank Junior made expected light work of JJ McDonagh on the undercard, when the Irishman failed to answer the bell to start the fourth round. McDonagh was down in the first, following a left hook to the top of the head. Eubank did as he pleased, as McDonagh tried and failed to connect with wild swinging punches. McDonagh signalled to the referee that there was a problem with his shoulder, and a halt was called to proceedings. Eubank now chases a big fight to end the year. Previous articleCAN OHARA HIT THE JACKPOT?